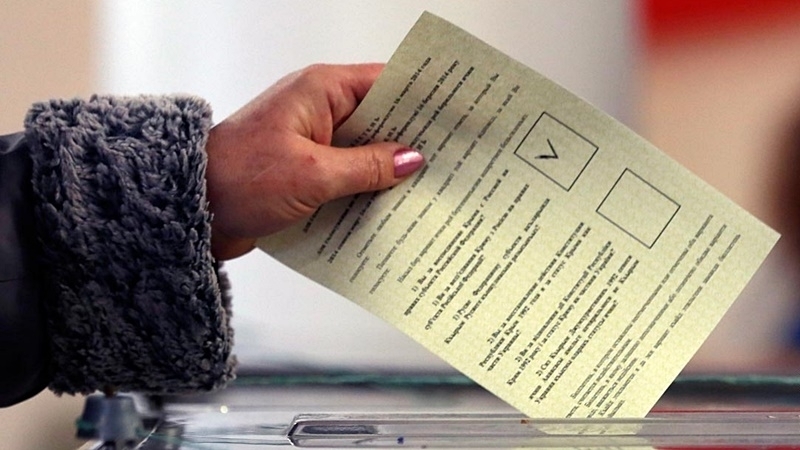 March 16, 2014 an illegal referendum was held in Crimea, after which Russia began to claim that the voting was conducted in accordance with local legislation and international practice. Before the referendum, the pro-Russian propaganda posters flooded the peninsula. Ukraine at that time recognized the holding of such a pseudo-referendum as illegitimate and unconstitutional. On March 15, 2014, the UN Security Council considered a resolution, according to which it was proposed to designate the referendum as "not having force". However, this attempt to consider the resolution was blocked by Russia. On the day of the "referendum," ballots were issued to all comers, even Russian citizens. Before the announcement of the voting results, the banks of the Crimea announced their conversion to Russian rubles starting the next day. Around noon on the voting day, the occupation authorities of the Crimea said that turnout at the polling stations was about 50%. At the same time, Western media claimed that correspondents were not allowed to the polling stations. Even before the closure of the polling stations in Simferopol celebration of so-called victory of the Russian Federation had already begun. 15 minutes after the closure of the polling stations, the results of the exit polls were published, according to which allegedly 93% of voters supported "joining the Crimea to the Russian Federation." In turn, the leader of the Crimean Tatar people Mustafa Dzhemilev noted that the turnout at the referendum was lower than 50%, and 99% of the Crimean Tatars did not participate in the voting. On the same day, the self-proclaimed head of the Crimea Sergei Aksyonov promised that on March 17, 2014 the so-called parliament would ask the Russian president to include the Crimea in the Russian Federation. October 7, 2015, Ukrainian President Petro Poroshenko signed a law, according to which February 20, 2014 officially considered the beginning of the temporary occupation of Crimea and Sevastopol by Russia. An illegal referendum was condemned by the governments of many countries of the world, such as the USA, Germany, Canada and many others. Moreover, the EU and the US imposed sanctions on Russia over the annexation of the peninsula. In 2017, at a meeting of the Third Committee of the UN General Assembly an updated draft resolution on human rights in the occupied Crimea was adopted. As a result, 71 countries supported the adoption of the document, and 25 were against, including Armenia, Belarus, Bolivia, Burundi, Cambodia, China, Cuba, North Korea, Eritrea, India, Iran, Kazakhstan, Kyrgyzstan, Myanmar, Nicaragua, Philippines, Russia, Serbia, South Africa, Syria, Sudan, Uganda, Uzbekistan, Venezuela, Zimbabwe. Later that year, the International Court of Justice in The Hague recognized the Mejlis of the Crimean Tatar people as the representative body of the Crimean Tatars. According to the court's decision, the Russian Federation should stop pressure on the Crimean Tatars and lift the ban on the activities of the Mejlis of the Crimean Tatar people. In addition, Russia will hold presidential elections on the annexed peninsula in the occupied Crimea, which was appointed on the day of annexation - on March 18. The PACE discussed the holding of illegal elections in the Crimea, and recognized their illegitimacy. In turn, the Head of the Ministry of Foreign Affairs of Ukraine Pavlo Klimkin said that everyone who is involved in the organization of elections in the Crimea should be sanctioned. According to the Minister, condemning statements about elections in the occupied Crimea from the international community is not enough. Earlier, Klimkin appealed to the inhabitants of the annexed peninsula with a request not to help the invaders to organize illegal elections and not to take part in them. The Ukrainian Foreign Ministry also plans to urge the Foreign Ministers of the EU countries to impose sanctions against those involved in the organization of elections of the Russian president in Ukrainian peninsula.